Flat screen for close fit. The design of this fireplace screen is sure to please the fisherman in your home! The scene is that of a fisherman catching the big one from the shore and three fir trees descending in size. 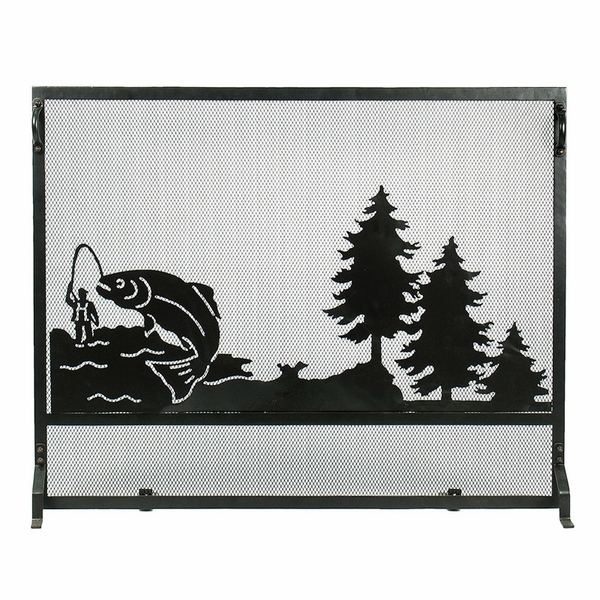 This fireplace screen will look fantastic in your den, cabin, or in front of your outside patio fireplace. The flat screen will allow you to put it up close to the fireplace surround saving you space, and keeping you safe from popping sparks. For convenient and cost saving shipping, the handles and the feet have been removed and packed separately. Some assembly required.